The sculptor who created this stone carving incorporated gestures and symbols to tell this story in a single scene. Notice how the figures in this scene are carved away from the background so deeply that they are almost completely three-dimensional. The halo over Jesus' head marks his divine status. It includes the sign of the cross as a reminder of Jesus' death. 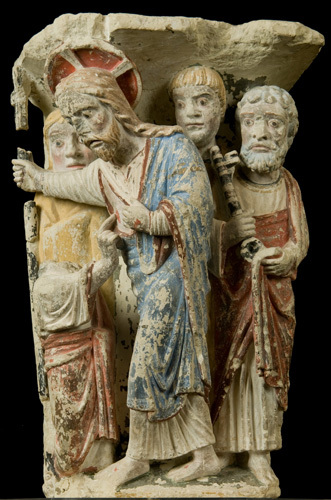 Jesus holds a tall staff which with a cross at the top, symbolizing his victory over death. Mary Magdalene was one of Jesus' most devoted followers. She was with him at his death and burial, and was the first to see Jesus after he rose from the dead. Thomas, whose head is missing, kneels and stretches out a hand to touch the spear wound in Jesus' side. One of Jesus' Apostles watches the meeting between Jesus and Thomas. Peter, the first of Jesus's twelve Apostles, carries a huge key, a reference to Jesus's passing on to him "the keys of the kingdom," or the authority to continue Jesus's preaching.